NTPC Recruitment 2019: NTPC Recruitment has recently out the notification for the enrollment of Engineering Executive Trainee (EET) post. National Thermal Power Corporation Limited(NTPC) is ready to fill 207 NTPC Vacancy. NTPC Recruitment 2019 is to recruit the candidates through the GATE Score 2019. Candidates those who are having the engineering qualification shall be eligible to apply for the post. Online applications are inviting from eligible candidates. The apply online link was activated from 10-01-2019 at NTPC Career ntpcindia.com. Interested candidates kindly visit the official site and read the notification to know your eligibility criteria. The last date for the submission of online application will get ends on 31-01-2019. So passionate candidates should submit your application on or before the last date. Other details regarding NTPC Recruitment 2019 is available in table format. How to apply for NTPC Recruitment 2019? Candidates kindly visit the official site ntpcindia.com. In the home page, there will be a link for NTPC Career. Click on the navigation link you will get into the career page. In that page, you will get the notification link. Click on the link, the official notification will get open. NTPC Recruitment 2018: Apply Online for NTPC Recruitment. NTPC Limited has recently announced the official notification for various posts. This NTPC recruitment is a huge opportunity for many Diploma and ITI applicants. Many aspirants are waiting to apply for NTPC Career. Utilize this incredible opportunity of NTPC career as it can provide handsome pay for eligible aspirants. NTPC Recruitment 2018 is focusing to recruit most noteworthy applicants. Please visit the official website ti apply for NTPC Recruitment. Apply earlier to avoid last-minute hassles.To know more details about the NTPC Recruitment, the applicants can refer the below-given details. The applicants those who are satisfied with the above criteria can apply for NTPC Career. Follow the given below steps to apply for NTPC recruitment. The candidate should click on the application form in the above link. Enter the valid details as asked in the application form. NTPC Recruitment: NTPC Limited has recently announced the official notification for various posts. This NTPC recruitment is creating a huge opportunity for many Diploma and ITI applicants. NTPC Vacancy is one of the most awaited vacancies for many aspirants. Besides that, NTPC career will provide handsome pay for eligible aspirants. NTPC recruitment is focusing to recruit most noteworthy applicants. Therefore all the aspirants can make use of such a wonderful opportunity. Similarly, this NTPC post will provide a career growth like central government. This post will also provide you eligibility criteria and age limit to apply for NTPC Vacancy. To know, even more, details about the NTPC recruitment, the applicants can refer the below-given details. The applicants those who are satisfied with above all the criteria can apply for NTPC Vacancy. In addition to that, the applicants should go through the official notification from the above-given link to apply for NTPC recruitment. The candidate should click application form in the above link. Enter the valid details as they asked in the application form. For the reason that, it will eliminate confusions during document verification. In addition to it, the aspirants should pay the fees before the last date. The candidates are can to apply 2-3 days before the last date. In order to avoid last minute site hanging. Certainly. Aspirants should recheck once before paying fees. Because it is non-refundable. Finally, aspirants can pay fees through debit card or credit cards. NTPC Recruitment 2018 – NTPC Recruitment Board has called to apply for 30 Diploma Engineers vacancies. NTPC Careers carries 30 Diploma Engineers vacancies to engage with the young and dynamic candidates. The Candidates who willing to apply for Diploma Engineers vacancies can apply online from the official website @ ntpc.co.in. NTPC Careers board has framed some eligibility criteria for the post of Diploma Engineers. So the candidates who meet the below eligibility can apply online. The job seekers who had dreamed to join in NTPC Careers, they can apply online right now for NTPC Careers. Furthermore details provided in the below section. Mechanical Diploma in Mechanical/Production engineering is eligible to apply for this post with a minimum of 70 % marks. Control and Instrumentation A diploma Graduate in the division of Instrumentation/ electronics engineering with a minimum of 70% marks can able to apply. Applications are invited from the interested and eligible candidates with certain eligibility criteria in the particular discipline. The post mentioned in NTPC Careers has eligibility criteria as mentioned in the official notification. It is an excellent opportunity for the candidates to grab jobs in public sectors. The candidates will be paid emoluments on monthly basis. Candidates can apply online from the official website or from the link provided in the table. More details about Job described in above table. Read and understand the details and apply accordingly. Click on the link provided to apply NTPC Careers. Attach the required documents which they asked for NTPC Careers. NTPC Recruitment 2018: NTPC Recruitment is available for 282 Diploma Trainee posts. NTPC Recruitment invites application from both the category candidates. NTPC Online Application is available from 18th April 2018 to 09th May 2018. The detailed eligibility criteria on educational qualification and age limit are described below. Eligible candidates need to apply online form from the official website or from the link provided below. Other details about the experience, pay scale, application fee, selection procedure and applying process for NTPC Recruitment are described in detail. For SC/ ST / PwD / ESM: NIL. NTPC Recruitment: Apply for 150 Executive trainee vacancies from NTPC recruitment board. Very recently NTPC recruitment board has published recruitment drive to hire engineering executive trainees to fill up 150 posts from NTPC recruitment. Job Alert from NTPC!!! Aspirants who would like to enter into the reputed organization to develop their career path apply for NTPC recruitment 2018. Ensure your eligibility criteria before to apply for NTPC career. Find more detailed info for NTPC recruitment follows as below. Dear Aspirants, NTPC Recruitment will create an excellent opportunity for Engineering applicants those who are interested to ameliorate their career with a leading public sector organization. NTPC is going to fill up huge vacancies through NTPC Recruitment 2018, so it will be the right time to gear up once preparation to catch their dream. The aspirants those who would like to apply for NTPC Recruitment should possessed Engineering in any one of the above mentioned stream. Full time bachelor degree with 65% from any reorganized university to apply NTPC Recruitment. The applicants those who are willing to appear for NTPC Recruitment 2018 should be under 27 years. The aspirants those who are like to apply for NTPC Recruitment 2018,No need to have any previous year experiences. The candidates those who are wish to apply for NTPC Recruitment 2018. Will be selected based on below mentioned processto fill NTPC Vacancy. The interviewee those recruited through NTPC Recruitment will get pay of approximately Rs.24900-3%-50500per month. The aspirants those who are wish to appear for NTPC Recruitment have to pay Rs.150 as application fees. The candidates have to fill the name and all the personal details as mentioned in GATE 2018 application form while filling for NTPC Recruitment. No other score will be taken except GATE 2018 for NTPC Recruitment. Once the personal details were filled, then the applicant has to move for paying fees for NTPC Recruitment. The application fees can be paid either by Online or by Offline for NTPC Recruitment 2018. NTPC Recruitment 2018Online paymentcan be done through Debit cards/ credit cards. For offline payment of NTPC Recruitment 2018, applicant has to pay (No. 30987919993) at CAG branch, New Delhi. Account Number for Offline fee Payment (No. 30987919993) at CAG branch, New Delhi. 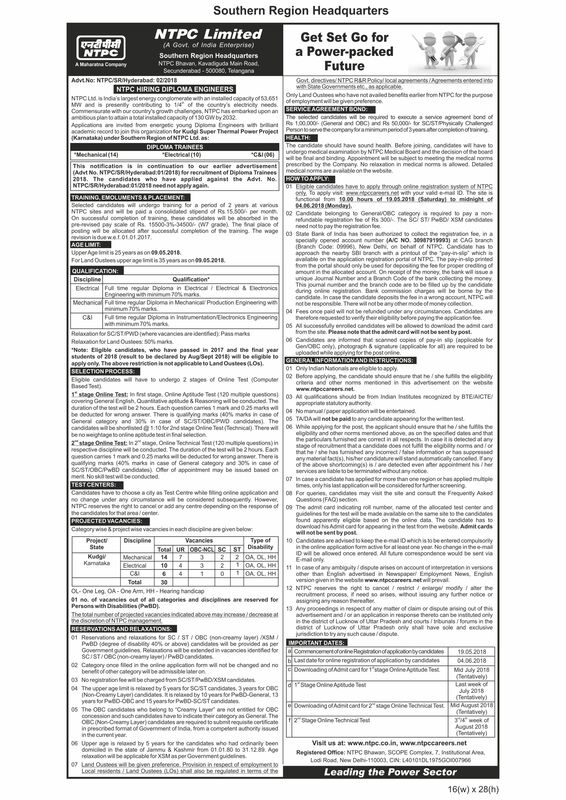 Dear Aspirants, NTPC – National Thermal Power Corporation Limited has published notification for NTPC recruitment-18. NTPC invite applicants for the Head/Executive Trainee Jobs. Interested candidates can apply through online and the last date for sending application will be on or before 21st DEC 2017. Applications are available only in Online-Mode. Candidates can apply for NTPC Career by log in to ntpccareers.net. Later selected candidates will be call for future process. Candidates should fill and submit application on or before 21st Dec 2017. Applications will not accept after last given by NTPC recruitment board. After your submission candidates will receive registration slip as well unique registration number. Keep that copy with you for your future reference. National Thermal Power Corporation Limited (NTPC) has announced the recruitment notification for the Post of NTPC recruitment Head/Executive Trainee. Eligible Candidates those who are interested to apply for this NTPC recruitment (NTPC Career) can apply on or before 21st December 2017. Candidates who are willing to apply for NTPC recruitment should done Bachelor’s degree in Mining Engineering with first class Mine Manager’s Certificate. For this job candidates should has 25 years of post qualification experience in the executive cadre. And also they should have some experience in maintenance of coal mining projects, project implementation and operations, experience in mine planning. Applicants who are all willing to apply for NTPC recruitment should have done U.G / P.G degree in law from any recognized university. Individuals should have 23 years of post qualification experience in the executive cadre. Candidates should have knowledge in law contracts. Experience in Transfer of property. Candidates should be handled in labour and service. Applicants applying for NTPC recruitment should have done full time of B.E/ B.Tech degree in computer science from any recognized university. Candidates must have 23 years of post qualification experience in the executive cadre. They already should handle with some implementing enterprise-wide IT projects, evaluation of IT systems with good analytic skill. Applicants who are going to apply against NTPC recruitment jobs, they should not be exceeding maximum 55 years. Relaxation of age limit may be considered in deserving cases. Selected candidates will get attractive salary as per NTPC recruitment board Norms. Candidates applying for NTPC recruitment should go to ntpccareers.net. It’s an official site of NTPC. After entering in to the site you can see the new notification as “Recruitment of Head of Mining, Head of Law and Head of IT, on fixed term basis for 03 years” Click the link. Then it will move to another page. There you click the scroll down button select your functional area and click submit. In your digital screen you can find the online application form. Read and fill it carefully. Upload required documents along with your photograph and signature. Click the submit button and download the registration copy. Candidates are advised to keep the copy safe for your future reference. Further selection process will be intimate you personally. NTPC – National Thermal Power Corporation Limited. NTPC is the largest thermal power plant founded in 1975. It’s Headquarters located in New Delhi. NTPC is an Indian Public Sector unit engaged to produce electricity and allied activities.